For less than $3.00, I was very ecstatic for three small beetroots. I got six in a pack at my neighborhood indoor farmer’s market and decided to use three in refreshing drink. So, I went chopping. I made sure to place parchment paper on cutting board to prevent staining from the beets. 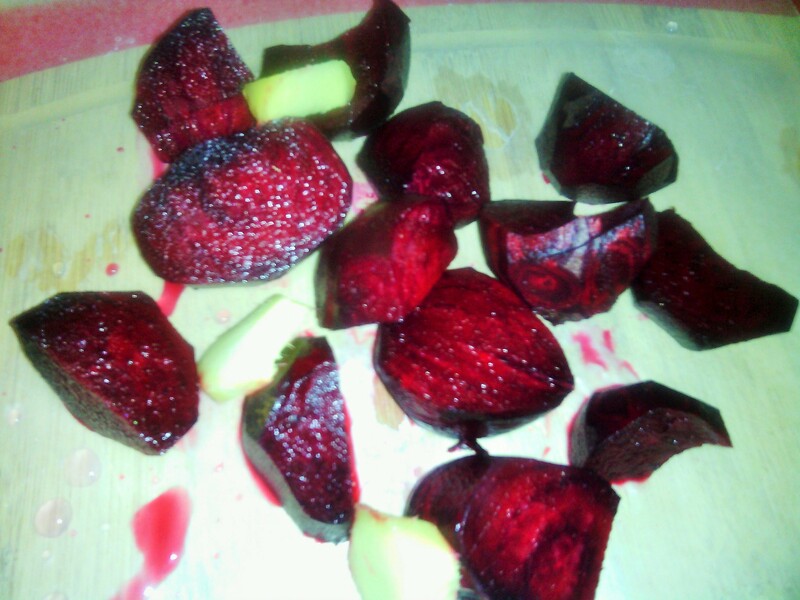 Beets were placed in a stockpot with about three cups of water along with finely chopped ginger. I allowed same to be simmered under low heat for about 20 to 30 minutes. This was then cooled and placed in standing blender with a squeeze of honey and half of a lemon. Nothing was wasted. All ingredients were blended to a smooth and drinkable goodness. The result was beneficial beet juice that was vibrant in color. Based on research, it’s revealed that beetroots are loaded with compounds that increase blood flow to the vital organs of the body. Subsequently, there is a boost in energy levels. I could certainly do with a little more energy. Moreover, statistics have shown that the blood pressure is lowered. So guys, bottoms up to the energy booster of a drink. I say let’s celebrate to this burgundy portion in my chutes. Salud!